Plus the cost of the 10 gallon Refugium Package ($150) you can get a complete system for $209.99 DELIVERED anywhere in the USA. You can also add multiple pico tanks to this refugium package! My 2.5 gallon pico is tied into my 200 gallon system. I bought a small, plastic tank from Petco for under $10. I found a bulkhead fitting with a hose barb for 1/2" tube from Pacific Marine Exchange for $1 each. I cut the right sized hole in the pastic tank using a jacknife and made the correct ID using a dremel and installed the bulkhead fitting at overflow level. Then I hooked up what I call my umbilical cord, which is a tube inside a tube. My inlet water is supplied by a small 3/16" tube like used for my RO water system which is ran inside my 1/2" drain line. I run the drainline through a 90 degree hose barb fitting and run the internal line out the end of the fitting. This makes it nice and simple having only 1 line running to/from the pico. For lighting right now I am using a 60 Watt compact Bright white (6500k i think). It is like a x-mas light bulb. I actually have part of the bulb submersed in the water for heat and more intense light. The zoas seem to be doing well and algae growing well under it. I have a pompom crab and 2 camel shrimp in it right now, they seem happy. Single line for inlet and outlet - my pico umbilical cord! 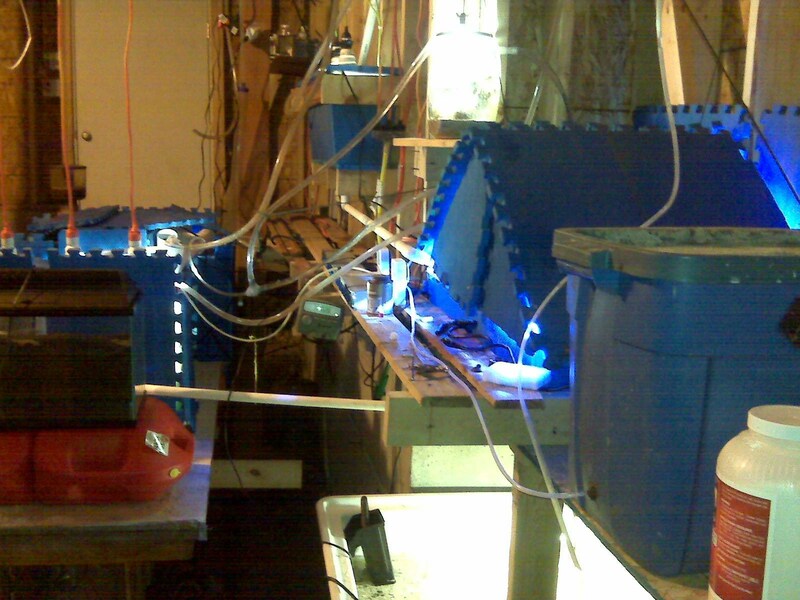 This is view showing my maze of tubes and tanks. The pico tank is the bright object just to the right of top center.